A traditional ghoul is a desert-dwelling, flesh eating demon. In ancient times, ghouls dwelled in burial grounds and other uninhabited places. The Shagghoulie is a fiendish type of modern ghoul, residing in the Las Vegas area. Luckily, they no longer kill. These weirdos are content to simply eat the hair, fingernails, dry skin, and any other dead tissue of the living. The creatures also prey on young children's shoelaces, drink rum, steal credit cards, and, on holidays eat the dead. They also have a nearly fatal fashion sense, stunning their prey with their fabulous shaggadelic jumpsuits. 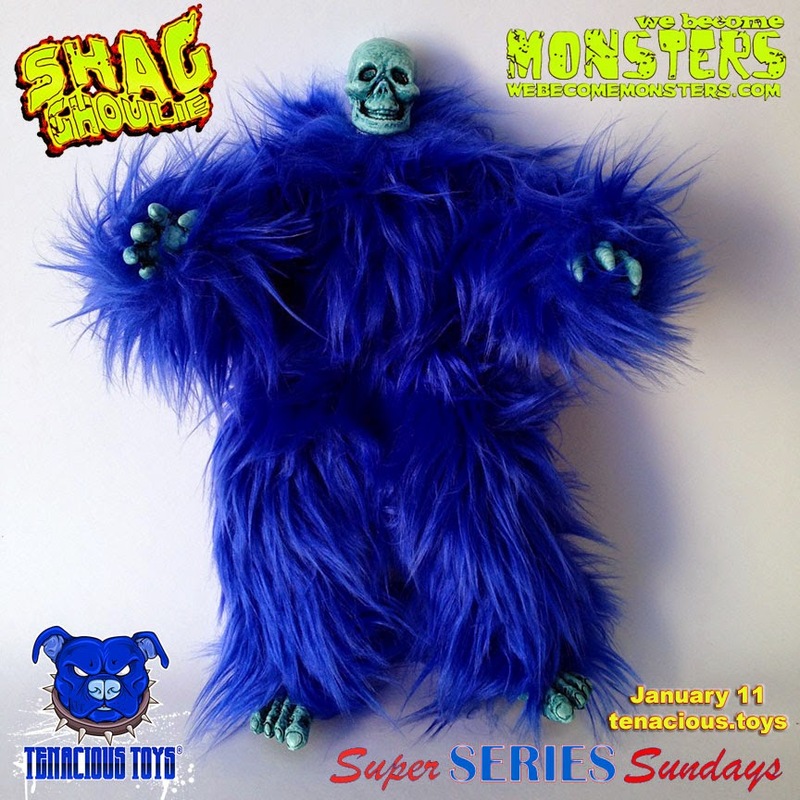 The Tenacious Toozie Scloozie Shagghoulie was created in vibrant blue fur specifically for Tenacious Toozie! 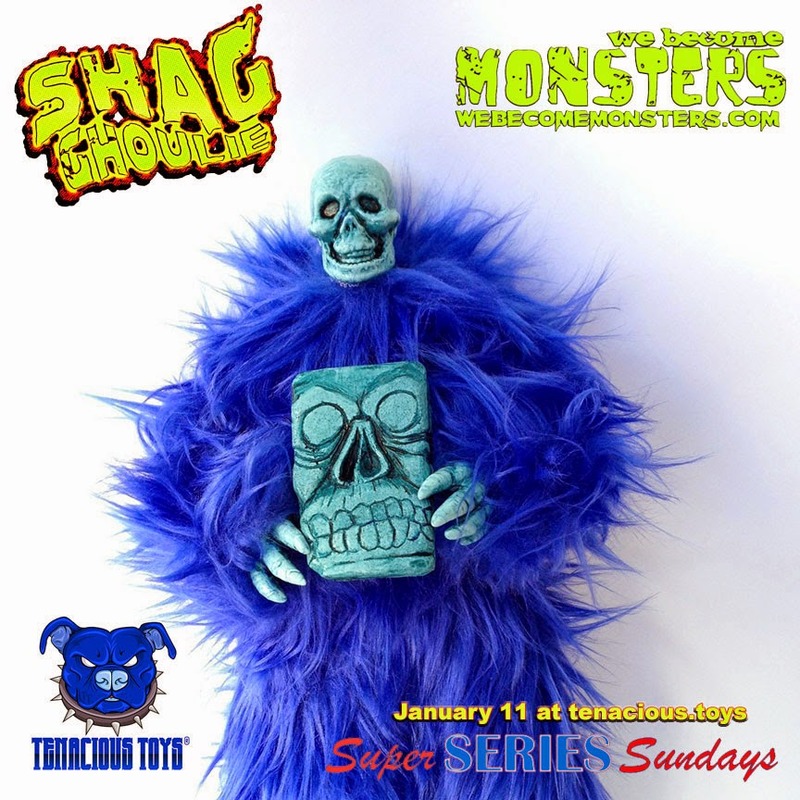 The We Become Monsters Shagghoulie figures are about 13 inches tall and feature an articulated 1:6-scale body with custom resin hands, feet and head, and a hand-sewn jumpsuit. This is an articulated resin art toy / mixed media piece, hand cast and hand painted by Chris Moore of We Become Monsters. All Shagghoulies come with a free micro SLAB. SLABs are WBM's waste reduction program that turns waste resin into art. 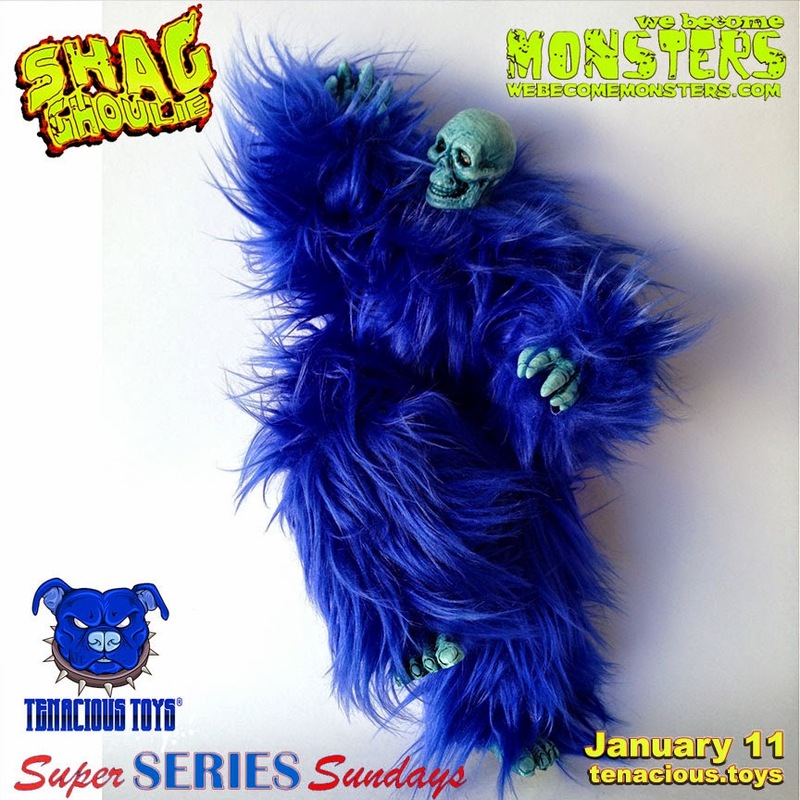 The Tenacious Toozie Scloozie Shagghoulie will be available for pre-order on the Super Series Sundays page starting at 7PM EST on Sunday January 11th, and shipping to customers 2 weeks later. This Shagghoulie is limited to just 10 pieces in this colorway (with all other colorways now sold out) and priced at $100 each. I don't think I've ever met anyone who disliked the Indiana Jones movies (the fourth one didn't happen, and Shia Lebouf is a toolbag). They were the reason that a great many people my age went into the field of archeology. Of all the movies in the series, my absolute favorite was The Last Crusade. The story, cinematography, humor, and action are damn near flawless. 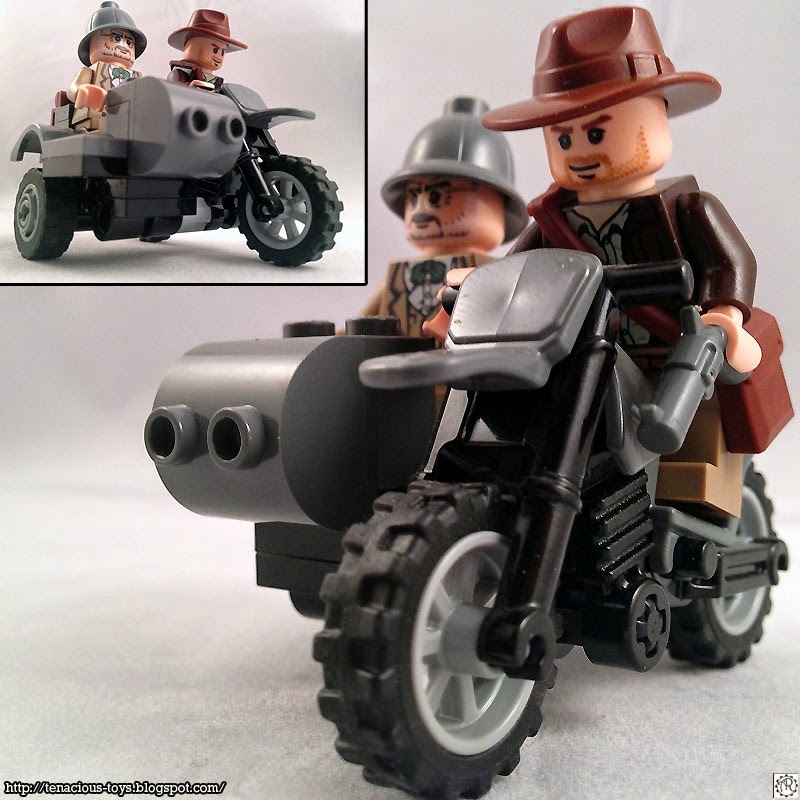 When a slew of Lego sets based on the adventures of Indy came out, I was not yet back into collecting Lego like I am now. 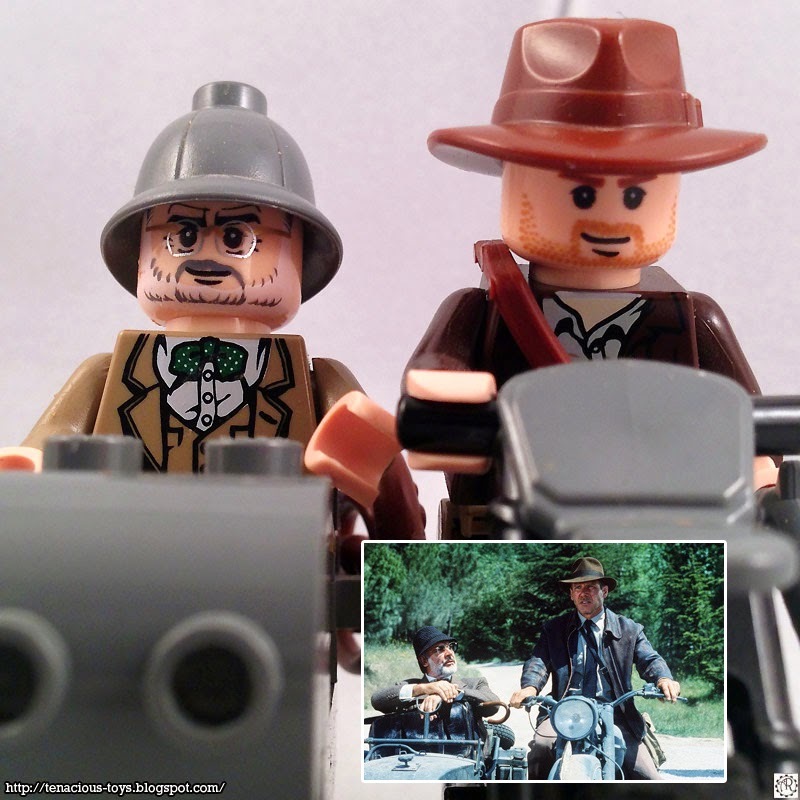 But my favorite scene for a long time out of Crusade had been the motorcycle chase and eventual impromptu jousting moment between the Jones duo and a German soldier, both on motorbikes. So when I came across this at TRU back in 2008, I picked it up. The likeness done for Sean Connery is one of the best I've seen on a minifigure, down to the details on the glasses. Harrison Ford's sardonic smirk and 5 o'clock shadow are also well represented. (Inset) A small map to the Holy Grail is also included. I get a kick out of when the minifigure graphics are as well designed as the ones shown above. 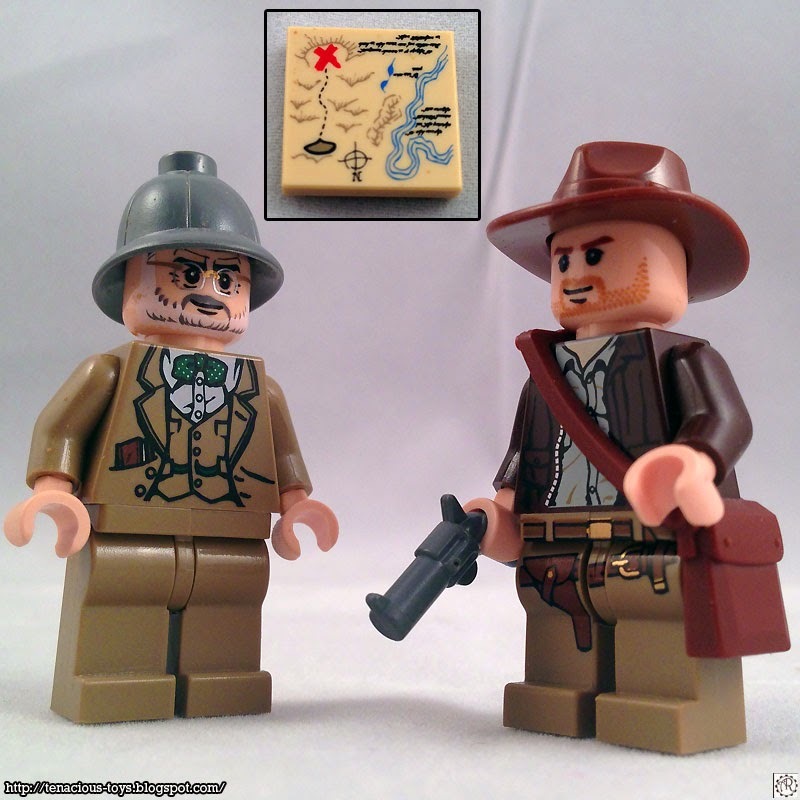 Nice touches on Dr. Jones's outfit include the polka dots on his bow tie (though not movie accurate), and his Grail journal that Indy was not supposed to have brought to Germany, to the shirt wrinkles and belts on Indy. 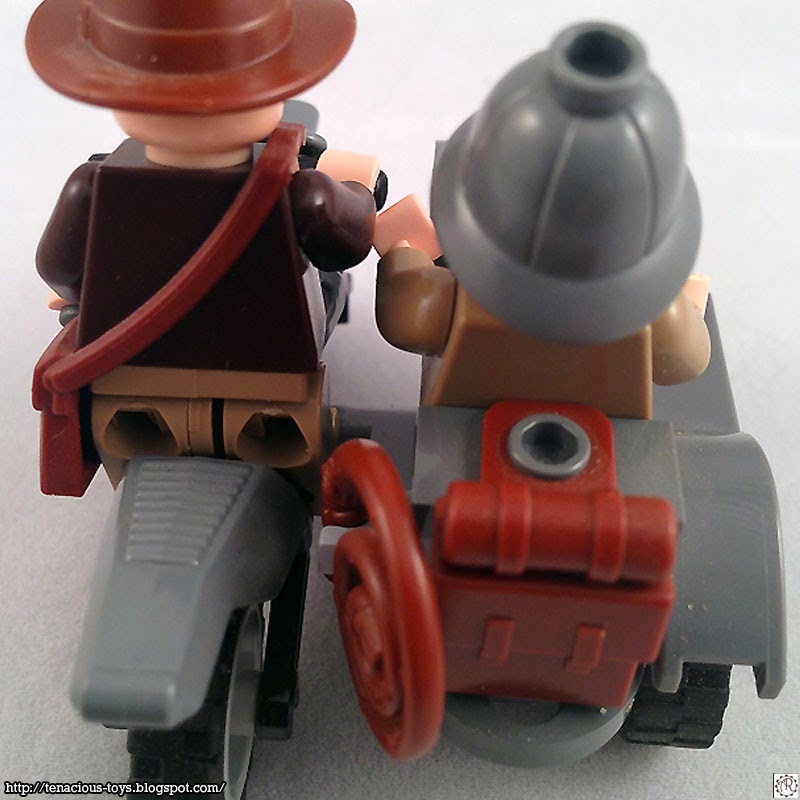 There are a couple of things that are off from the icon scene (a still from it is shown inset), including the fact that Indy still is wearing a tie, his satchel is olive green, there is a headlight on the front of the bike, and a spare tire was on the rear of the sidecar, as well as Dr. Jones having a trilby with it's brim all the way down for his headwear (the Lego part looks like a British Empire pith helmet to me) , and his tie in the movie was actually much darker. Considering that this motorbike uses almost all pre-existing parts for it's construction, Lego did a respectable job with the end result. It's easy to put together and holds up very well. There are places on the back for a whip and a satchel. Regardless of some of the inaccuracies, the motorbike set up looks nice. I plan on updating this later with the rest of the set as soon as I locate it, but I did want to at least get this little favorite of mine showcased on here. Thanks for reading, I have many more reviews coming now that I've started opening and photographing a larger portion of my collections. - Mario, the Rogue Hobbyist. Trivia & Fun Facts When casting for the role of Henry Jones Sr., Sean Connery was cast because Steven Spielberg and George Lucas considered that the only man who could play Indy's father, was James Bond. 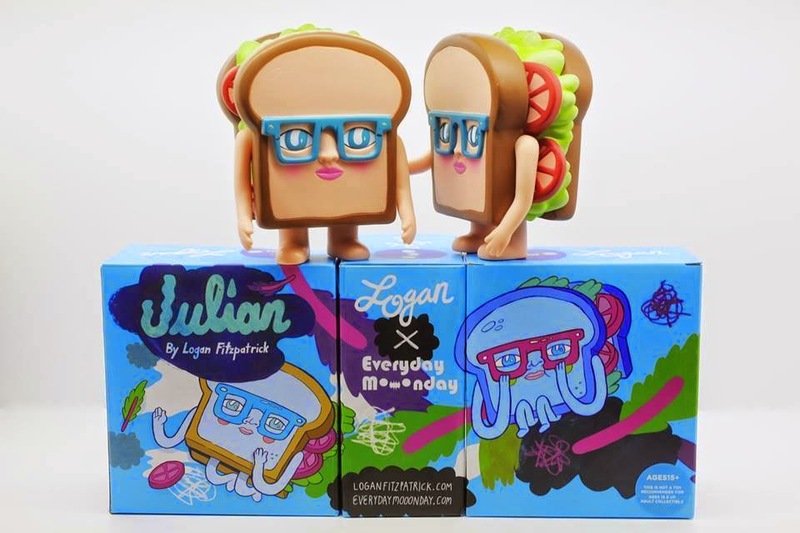 A South Korean based company named Everyday Mooonday, has teamed up with Brooklyn based artist Logan Fitzpatrick, to create "Julian". Everyday Mooonday is a Gallery based in Seoul, Korea. Logan Fitzpatrick actually had a solo show at the Everyday Mooonday Gallery, which ran from March 7 to April 11, 2014. 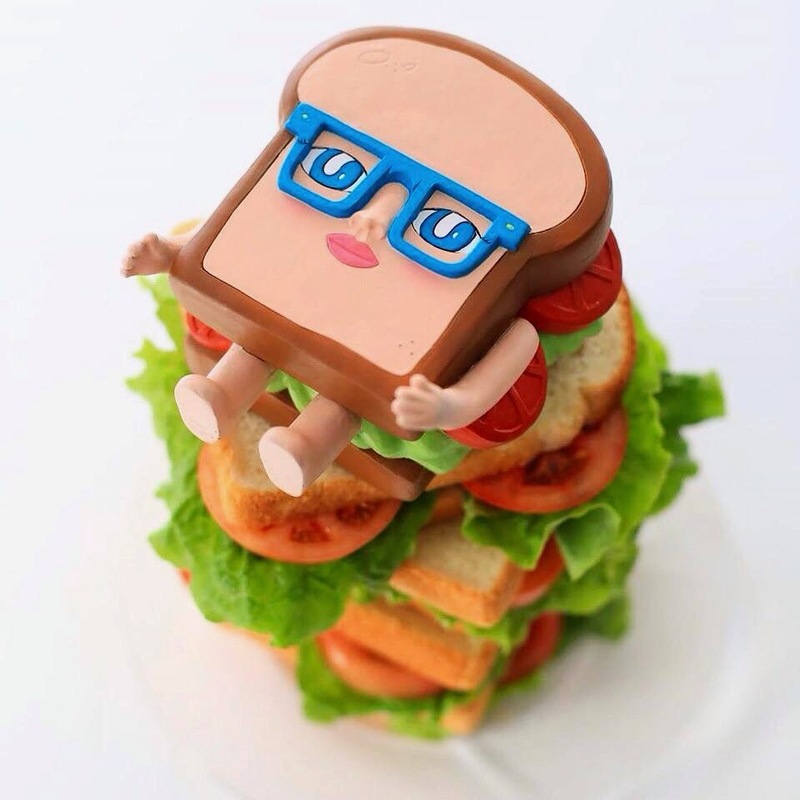 "Julian" is Everyday Mooonday's first art toy, which is limited to just 500 pieces. Standing at 15cm (~5.9 inches) and made of soft vinyl, Julian's $59 price may seem a bit high but the piece does translate Logan's art very well. Hopefully this won't be the last art toy produced by Everyday Mooonday. Be sure to follow Everyday Mooonday and Logan Fitzpatrick on each of their respective websites. 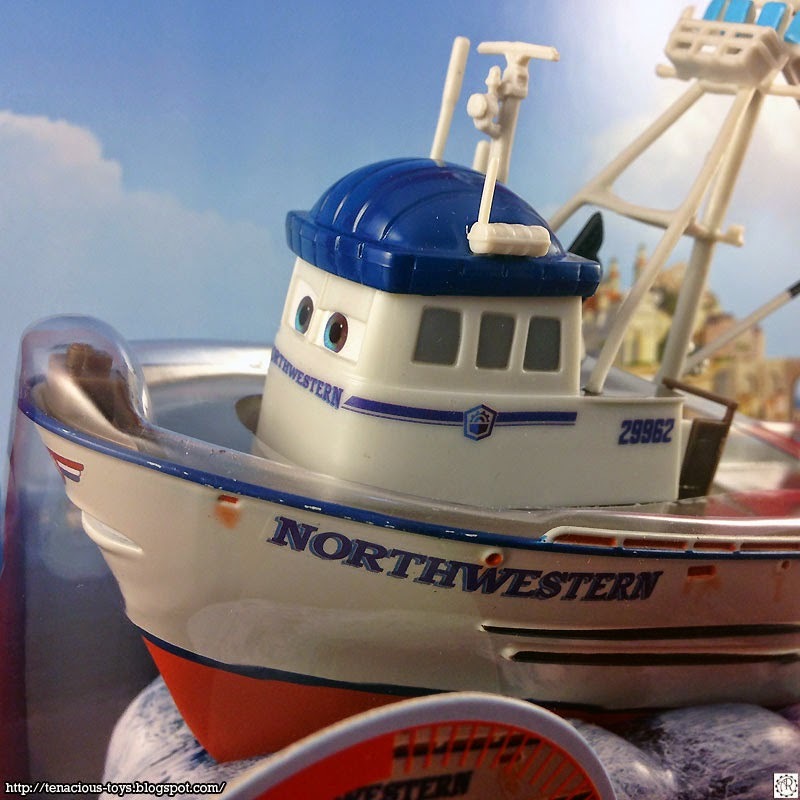 Pixar Cars - Disney Store "Crabby" Tugboat - An issue of scale. 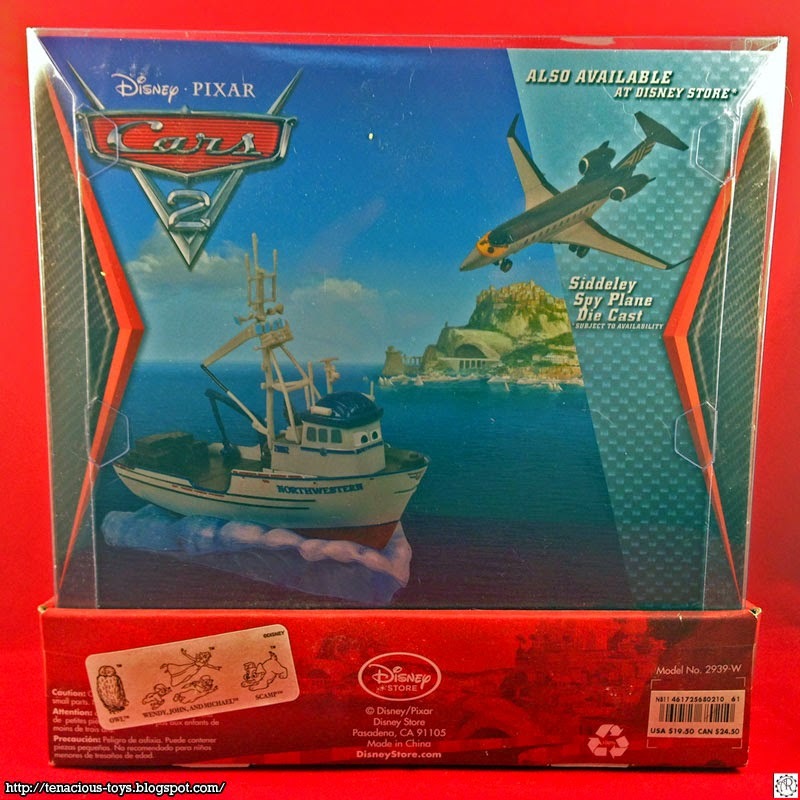 When it comes to the way that both Mattel and Disney are handling the seemingly endless run of Cars related diecast toys, there are moments when Mattel seems to be the obvious leader because of release count, diversity of line, and exposure in stores. The Disney Store has kept a premium sort of presentation since the first movie with it's larger scale releases. Very much made to showcase in the box for the adult collector. But there are really nice standouts that the Disney store takes care of, that don't even make it into the normal diecast line by Mattel. 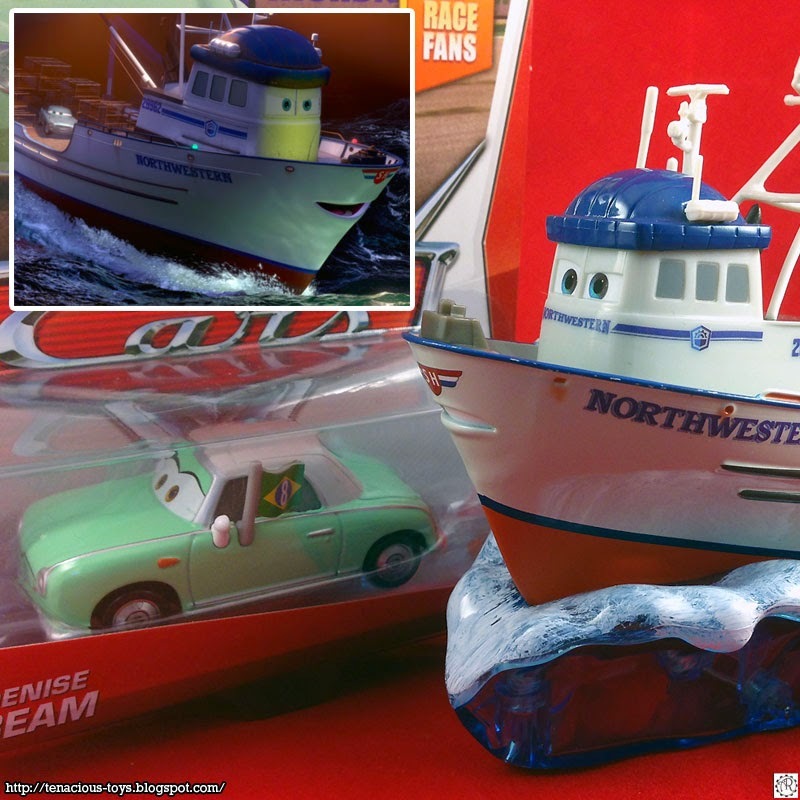 This is one of the characters in Cars 2 that was only seen in the early part of the movie, in fact being the first character onscreen that helps identify one of the new main characters, Finn McMissle, and sets the stage for letting people familiar with the Cars world that the action will be taking place in a very different place than the desert area of Radiator Springs. I recall as a kid seeing a film about tug boats and how powerful they were. Pushing boats around and seeming to be these just awesome little hard survivors of the sea. I'm not going to kid, I was disappointed that there was not more to this character because his design and personality immediately seemed more interesting than Finn's (whom, if you've not seen the movie, was onboard being transported out to sea). Closeup of the front of Crabby. I'm not a completion crazy collector when it comes to the Cars line in regards to buying every release. I prefer to get the characters and playsets that compliment each other scale wise and especially the ones that I liked the designs of. 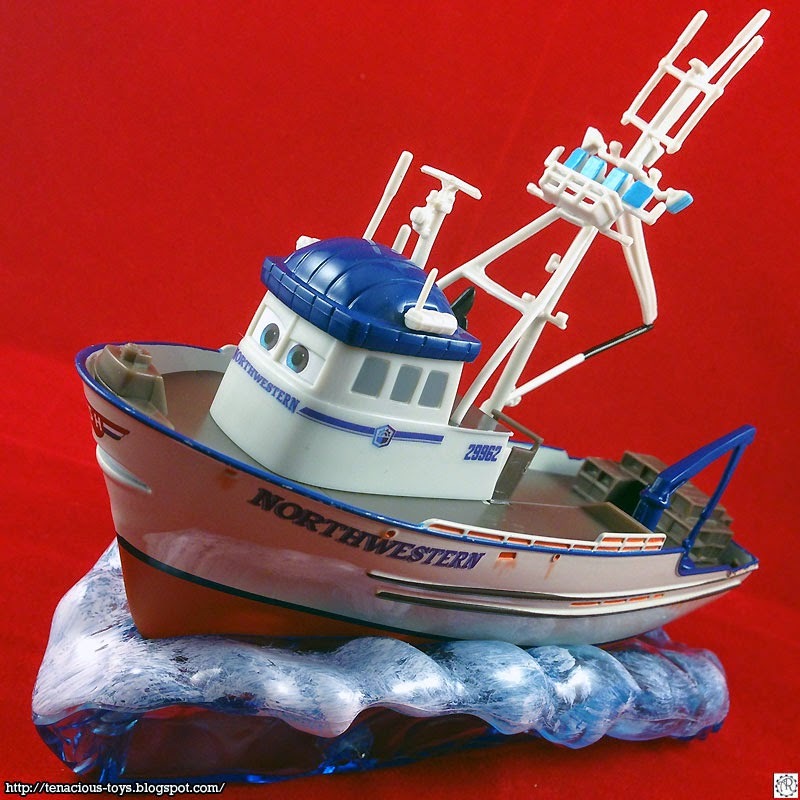 After opening up the display box, I was already enjoying the overall detail and the nice touches of worn paint and rust stains that were all over the hull. 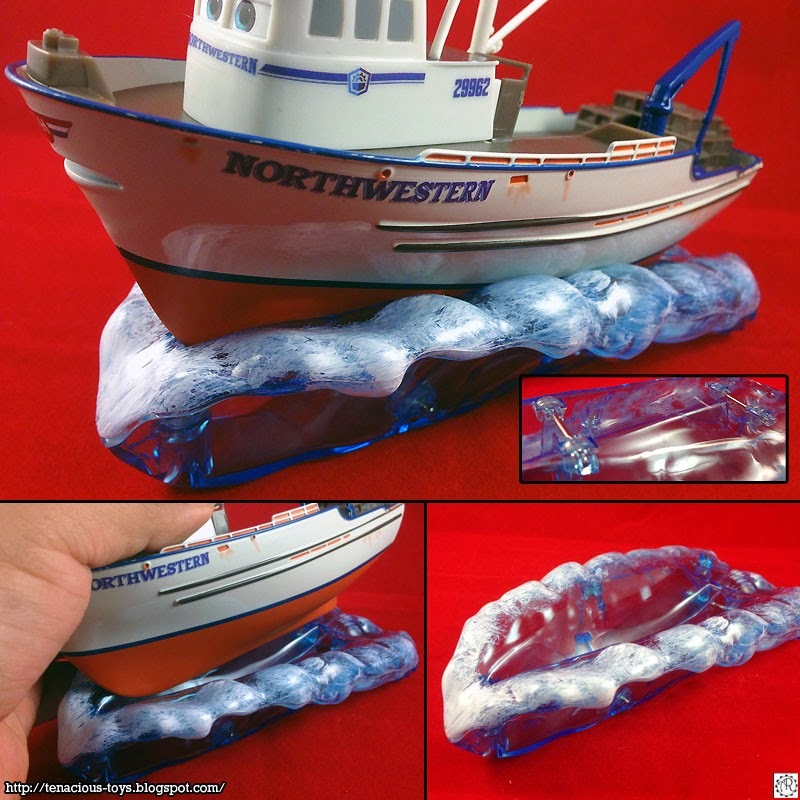 A few more protective plastic pieces cover other parts of the softer plastic parts on the deck. The hull is actually the only part that is diecast metal, the rest of it is varying degrees of plastics, some soft, some more rigid. Sort of an odd construction as some of the earlier releases were almost all metal. Though the outer box had some scuffs on it, Crabby is well protected inside. Crabby, as you can see below comes with this great add on that adds to the play value for the younger set. It's this blue plastic combination display stand and rolling play platform that when I first looked at the packaging, hadn't even noticed it. Crabby in the included play platform/display stand. The deck and other details don't have as nice of a paint application to them. 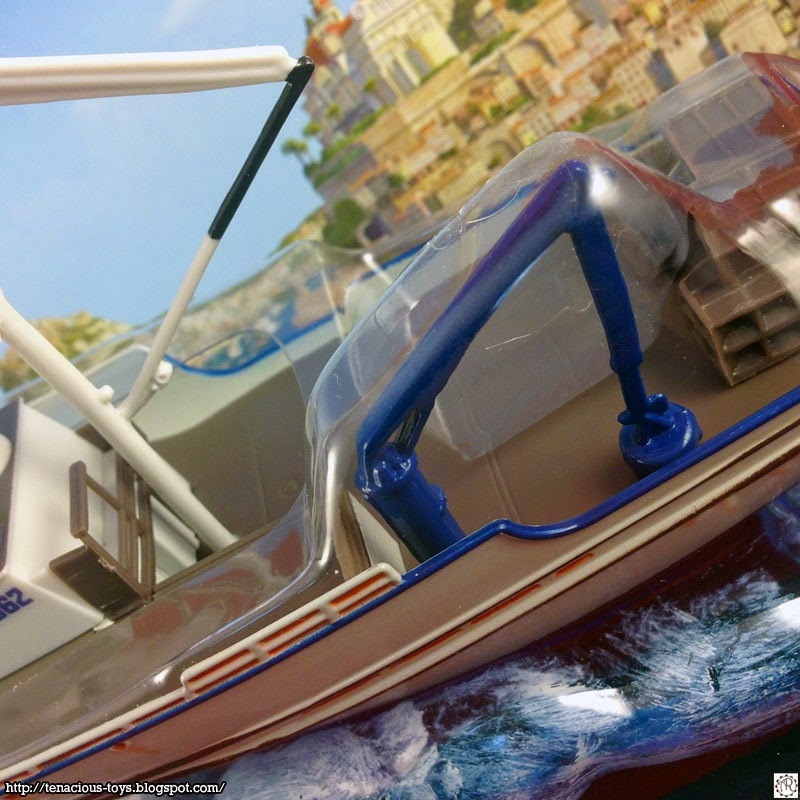 The rolling play platform is sturdy, well made, has four low profile wheels under it, and a nice application of white and blue paint to the wave break part on top. 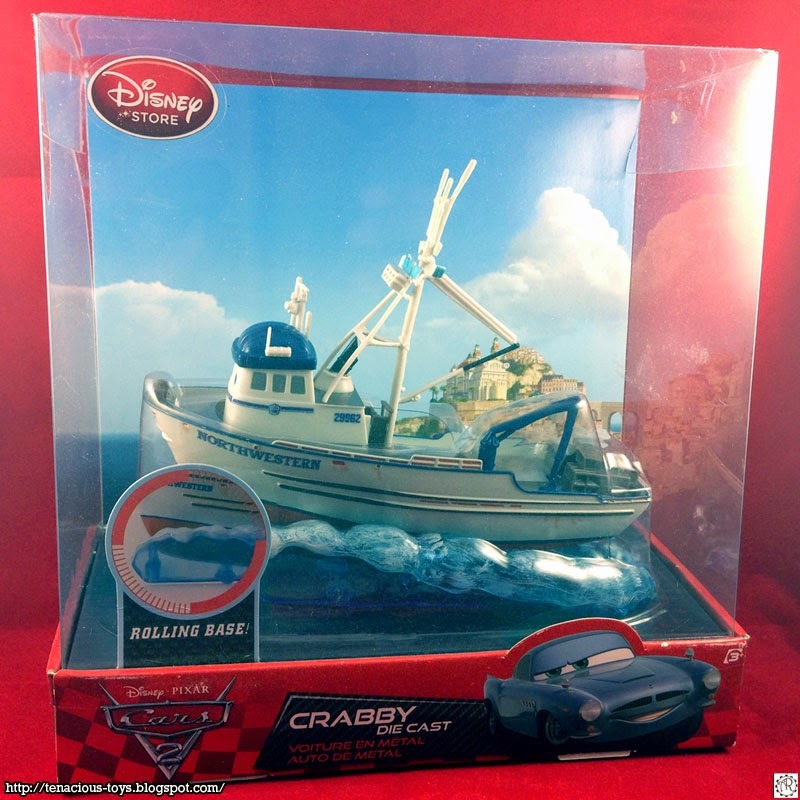 Scale wise, Crabby doesn't come close to the size relation that his movie role depiction shows, but he is decently sized for what he is, and with some small exceptions the graphics on him are fairly accurate. My final thoughts on this diecast? I'd say he's a good buy if you can find him around the $20 or under range. For completionists, it's the better release to get for your Cars collection compared to the one that came out in the Mattel "Action Agents" line, which looks to be suffering from some sort of late era Elvis bloating or something. Seriously. It's a goofy looking toy. 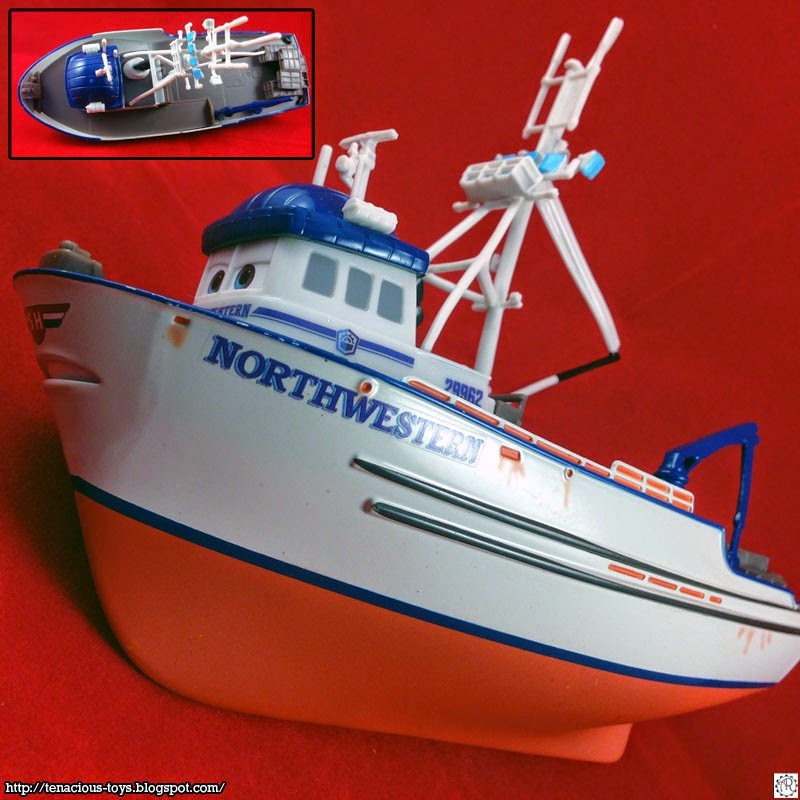 Trivia & Fun Facts Though the toy above has a diecast metal hull, most tugs in the real world are built of wood or metal-sheathed wood; the resiliency of a wooden hull prevents damage to both tugboat and vessel in sea/dock operations.